A wastewater treatment professional will often recommend a septic tank conversion as a suitable remedy for a problematic septic tank or sewage system. It sounds intriguing but what does it mean, why is it necessary and what will it cost? In this blog post we discuss what’s involved when converting a septic system into an functional sewage treatment plant. Why convert a septic tank? A septic tank conversion is a method of upgrading a septic system that may be old, broken, or failing to meet treatment standards. Wastewater treatment professionals usually recommend this option when the existing sewage system retains some levels of functionality and could still be useful in treating the sewage. In general, converting a septic tank means adding specific treatment equipment to the existing system. You’ll often hear the industry professionals refer to such equipment as conversion units or kits. 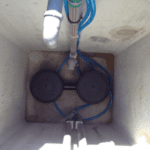 Once connected, the conversion kit will significantly improve the treatment efficacy of the system and therefore the standard of the treated wastewater. Faulty septic tanks pose a threat to water quality and public health by contaminating ground water sources and exposing us to nasty pathogens. There are approximately 1 million E. coli bacteria per litre of effluent from a typical domestic septic tank. The drinking water standard for E. coli and coliform bacteria is zero so there is simply no room for compromise. If your septic tank needs upgrading its in everyone’s best interests to do so. What differs on a case by case basis is where to put the conversion unit in relation to the old septic tank. Installing after a septic tank means connecting the unit to the outlet, or downstream of the septic tank. This particular type of conversion unit is known as an add on. In this case, the septic tank acts a form of primary wastewater treatment. The advantage here is that it will intercept slowly degradable items such as baby wipes and tampons while the conversion unit completes the task of cleaning of the wastewater. The other option is to install a conversion kit into an existing septic tank, known as an in tank conversion. At the present moment, there is no European Standard for in-tank kits, so they can not obtain a CE mark. This does not mean that they do not work, but rather that they can not be tested to any of the EN 12566 standards for small type sewage treatment plants. However, in tank conversion kits can be just as effective when it comes to treating the wastewater. It is up to the relevant local authority or governing body to approve an in tank conversion kit for use in an existing sewage system. It must have the capacity to improve the existing quality of the effluent to acceptable standards and you can ask the supplier for proof of performance. If you are thinking of buying an in tank conversion unit, contact the relevant local authority to seek advice on the matter. It will depend on the general binding rules for your locality [see rules for England, Scotland, Wales, Northern Ireland, Ireland]. What will a conversion kit cost? You can breathe a sigh of relief that in general, a septic tank conversion will cost less than a new sewage treatment plant but you must be certain that it is the most economical long term option. This is largely to do with the health of your existing sewage system and a wastewater treatment professional will advise you best here. Whether you are using an add on or an in tank conversion kit, you’ll need access to the septic tank and access to a power supply as most conversion units require electricity to operate. An add on conversion unit will require digging a suitably sized excavation close to the existing sewage system. Once in the ground, the installer will connect the septic tank outlet to the conversion unit. For in tank conversions, there must be enough space to house the equipment which the installers will put into place once they gain access to the tank. All in all, septic tank conversions are a useful and cost effective way of improving the performance of your sewage system but only if the existing septic tank is in suitable condition. Do not go ahead with any installation without first checking that the conversion unit is approved by the relevant local authorities. Any reliable wastewater treatment professional will provide the appropriate test results to prove the efficacy of his/her conversion system. With the risk that an old or faulty septic poses to human health and the environment, upgrading or replacing is worth the money. Hi Peter, thanks for getting in touch. Please email the planning reference number and any other relevant information to sales@biocellwater.com and we will get back to you. Regards, Hannah. I just need a some upgrade and a cert to say it is now a treatment plant too for planning.